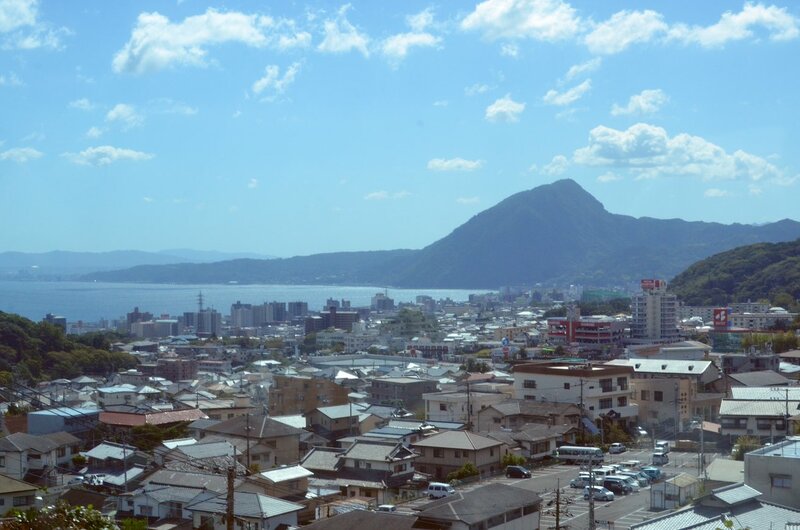 Beppu City (別府市) is the second largest city in Oita Prefecture. This tourism driven city is on the east coast of Kyushu and looks out from the centre of a wide bay onto the Seto Inland Sea. 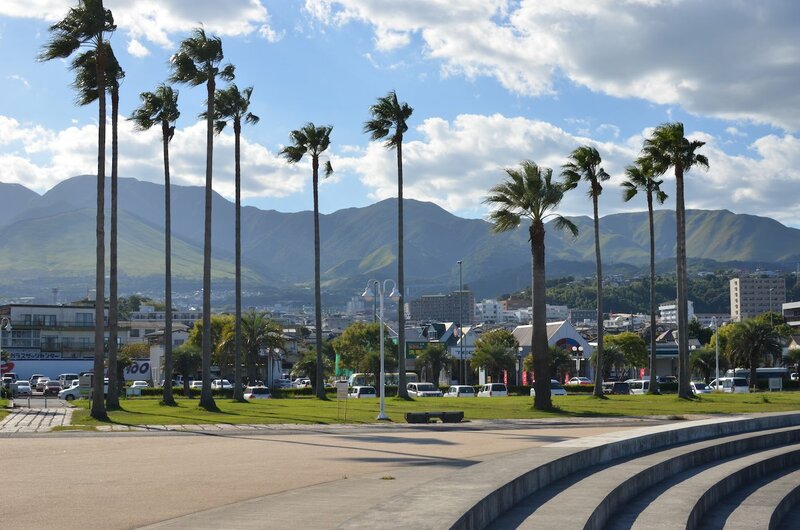 Oita City, Beppu's much larger and more serious companion, is on the south side of the same bay. The volcanic mountains behind the city to the west are the source of heat for the area's prodigious number of hot springs. These springs are captured (cooled if necessary) and piped into baths that are called onsen (温泉) in Japanese. Over 8 million people each year visit Beppu City to relax and soak in its many onsens. Hot spring water flows out of the ground from all over the city. The city claims to have the highest output of hot spring water (>87,000 litres/minute) and most number of hot springs (~2,300) in Japan. This is estimated to be 10% of all hot spring flows in Japan. From ancient times, it was widely known that the eastern slopes of Mount Tsurumi contained hot springs. Its tendency to erupt and squash settlements made it a marginal place to live. Also, the high flow of spring water made the area a stinky and marshy wasteland. While a few hot springs were harnessed earlier on, it is only in the early 1900s that fledgling tourism allowed a resort destination to grow here. 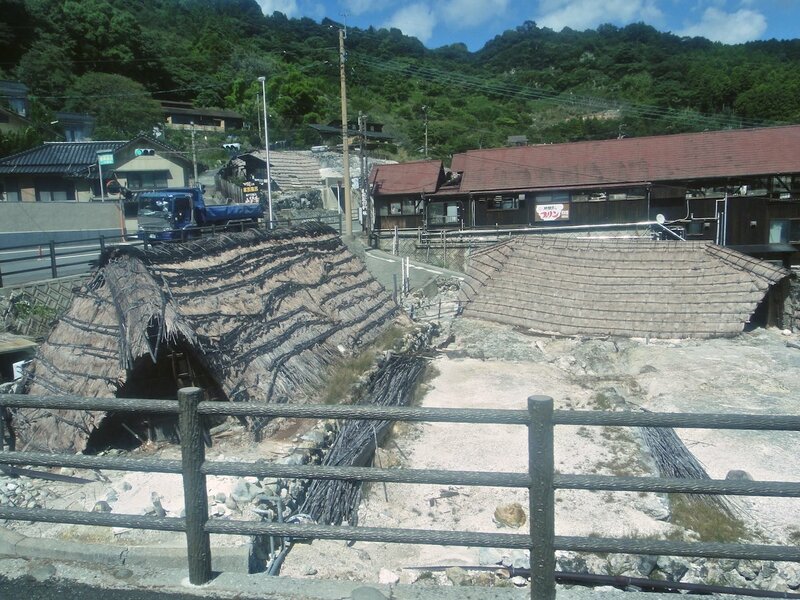 Beppu was helped by the fact it was easily accessible by ship. The area's former savage and forbidding image is recalled by the Jikoku Tour (Hell Tour) set of hot spring related attractions. 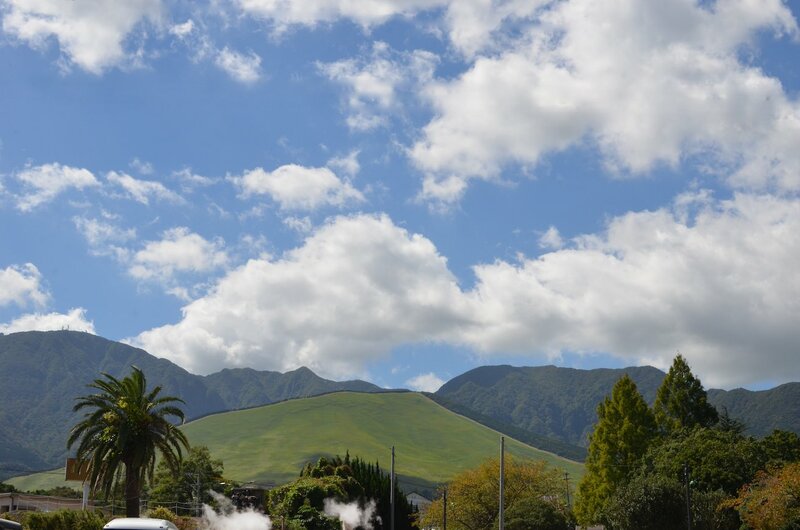 The Beppu Hatto (Beppu 8) are the 8 main hot spring areas in Beppu. They are Beppu, Kankaiji, Horita, Myoban, Kannawa, Shibaseki and Kamegawa. Many separate onsens refer to the same area in their name. There are so many onsens that actually listing them would be impossible. If staying in Beppu, check the hotel listing for features like an outdoor bath and private baths. The day tripper can ask the excellent tourist information in Beppu Station for advice and directions. So, let's not be shy and dive into some of the famous onsens of Beppu. From ancient times, hot spring water has flowed out from the sandy shores of the bay, but land reclamation and road widening has taken a toll. This seaside sand bath is the last natural one remaining. 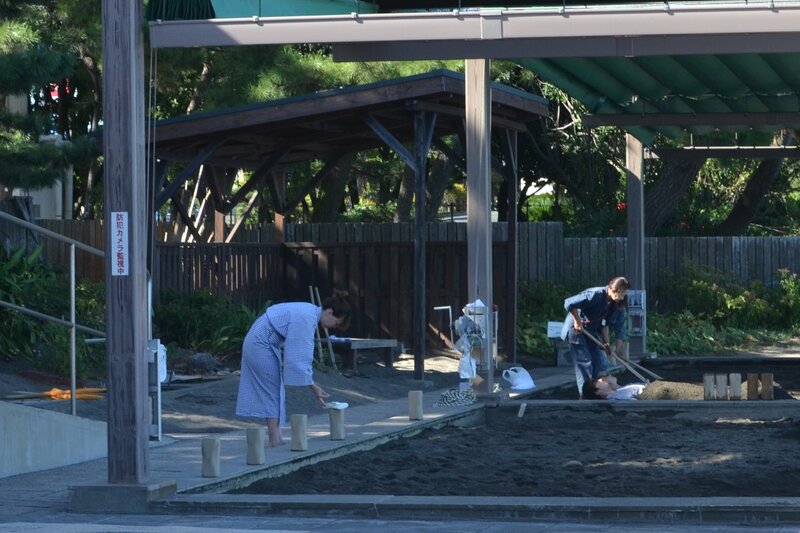 Attendants cover you with sand that is warmed and moistened by the hot spring. After steaming in the sand by the ocean, a regular bath awaits. Located in the Kamegawa area. 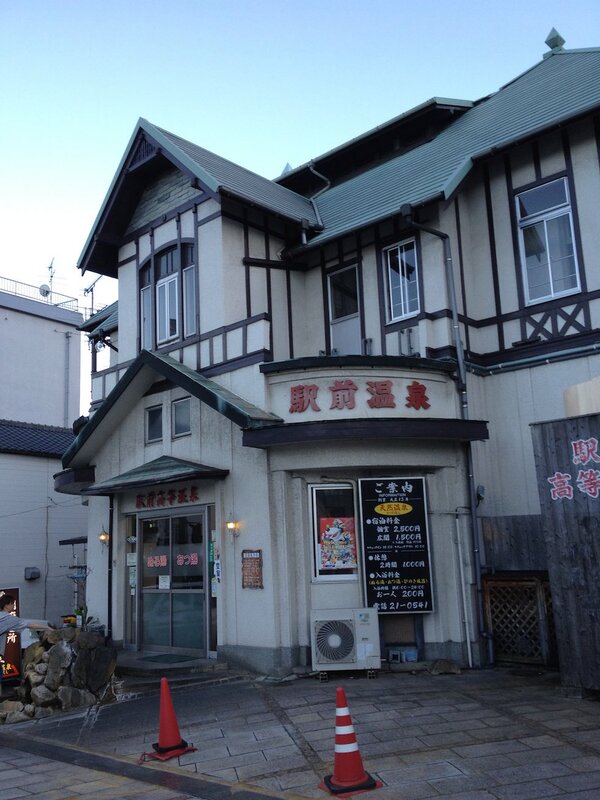 This onsen is just a few minutes walk from Beppu Station. It was built in 1924 as Beppu began to boom as a tourist destination and the unique half-timbered design still stands out. The baths themselves face stiffer competition today. This is part of the Beppu area. The famous bath salts, Yu no Hana, have been manufactured here since the Edo Period. The salts are still produced using traditional folk methods. You can take a dip in the medicinal waters that have a high alum content and then take home the salts. Located in Myoban area. This large outdoor onsen at the Sugino Hotel allows you to enjoy the scenery of Beppu while soaking. It's mixed bathing, so bring your bathing suit. Located in Kankaiji area. 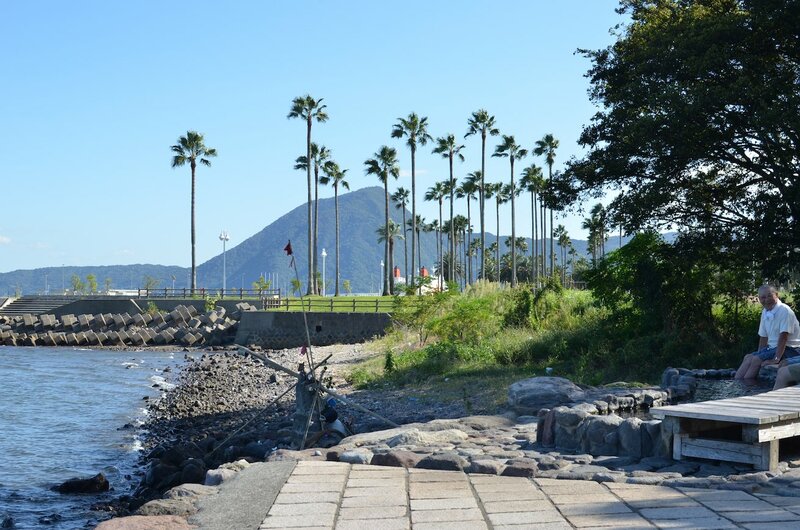 These attractions are all associated with Beppu even if some are in other cities or towns. This open-air zoo allows you to see African wildlife as you tour around their habitat in your car. The zoo is, of course, divided into sections with compatible animals so the lions don't eat the giraffes. The zoo is to the northwest of Beppu towards Usa City. An amusement park with rides and some adorable animals (penguins and petting zoo types). It closes during the winter. 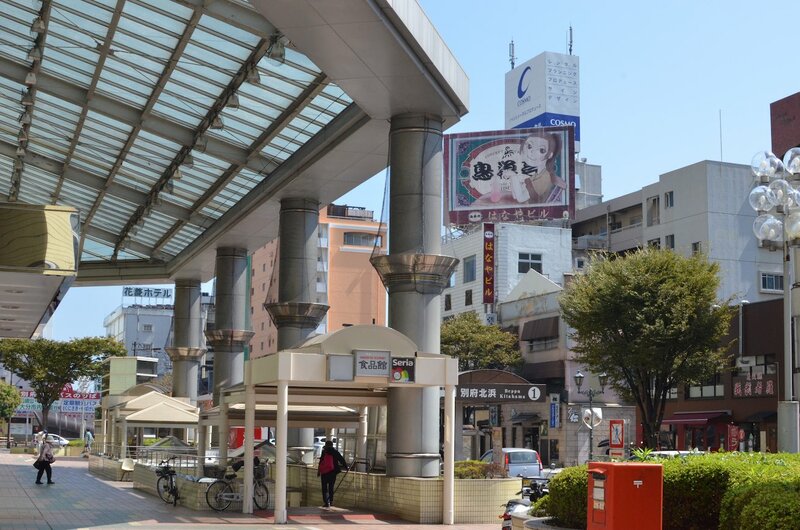 It is located in the hills to the west of Beppu Station. The hot springs on the Jigoku (Hell) tour aren't for bathing in. They are a remnant of an age when those who came past here reported tales pools of bubbling mud, ponds of amazing color and water shooting from the ground. The modern city may have tamed the area, but the collection of attractions on the tour show (some more authentically than others) the natural power of the hot springs. The top of Mount Tsurumi (1,375 m) can be easily reached thanks this ropeway that opened in 1962. From the summit, the entire Beppu region can be seen below. Buses to here leave from the west side of JR Beppu Station. Hello Kitty and Sanrio's other characters come to life in their own theme park. It's very cute and aimed squarely at kids. Located north of Beppu in Heji Town. Takasakiyama Natural Zoological Garden is a monkey park south of Beppu halfway to Oita City. It is run like an open-air zoo exclusively for Japanese macaques (or snow monkeys). Umitamago (Oita Marine Palace Aquarium) is a large aquarium with an impressive history located halfway between Beppu City and Oita City. It reopened after an extensive renovation in 2004. The history of perfume and the culture of its use is explained in this museum. You can try making your own perfume or relaxing in an aroma therapy room as well. The fragrance museum just south of Beppu's Jigoku Tour and near Beppu University. The availability of natural boiling hot water attracts interest in using it in inventive ways. As such, Beppu's some of most famous products are cooked using it. Onsen-tamago (温泉たまご) or eggs hard-boiled in hot spring water can be purchased in many shops. 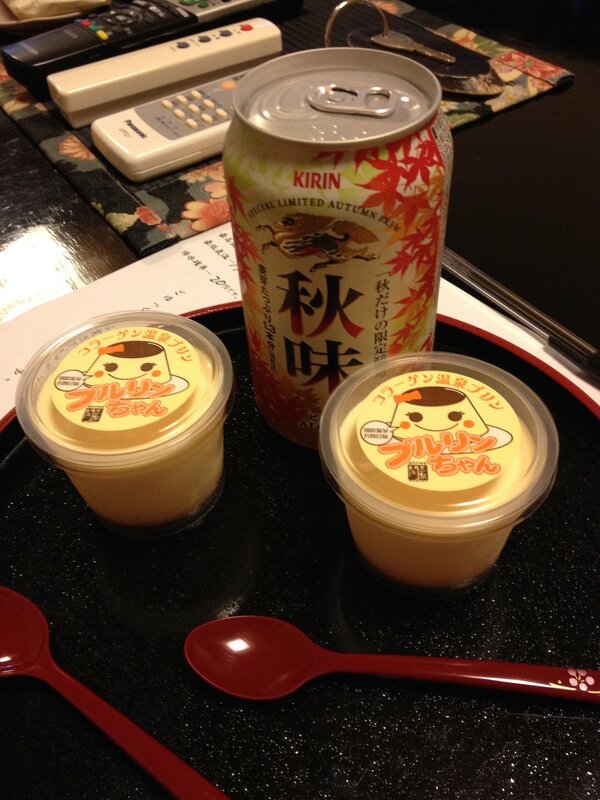 Pudding is another commonly found food. Bath salts manufactured based on the minerals dissolved in the water can be found throughout the city. As tourism became possible for Japanese in the early 20th century, Kumahachi Aburaya (油屋 熊八) saw the opportunity to turn the local natural wonders into the resort destination that it is today. This businessman was the tireless promoter, energetic showman and tourism innovator behind much of the early success of the area. He is credited with the saying "Mt. Fuji for mountains; Seto Inland Sea for oceans; Beppu for baths" that linked Beppu to the pantheon of more familiar and famous destinations. 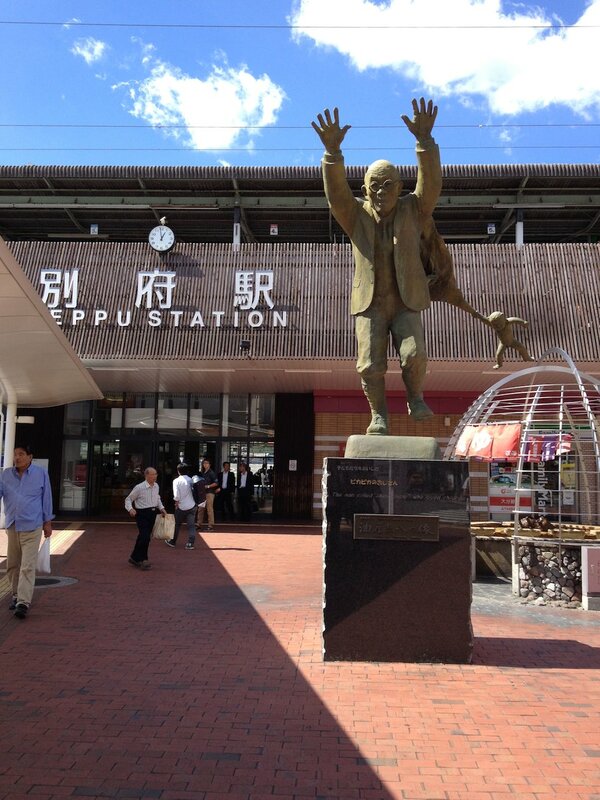 A statue to the "father of Beppu tourism" stands in front of Beppu Station. The first tourism ferry begin running in 1912 between Kobe, Osaka and Beppu. In 1928, the first female guides were taking groups around the Jigoku Tour. The area received very little war damage during World War II and was up and running quickly after it ended. As a result, the area was popular for honeymoons and school trips. Business boomed through the 1950s and 1960s. Changing tastes and resurgent domestic competition saw visitor numbers drop off by the 1980s. Even still, the presence of hot springs within a built up area is rare in Japan. The number of foreign travellers increased and the city remains the most popular for school trips in the area. B-Con Plaza, a conference centre, was completed in 1995 and the city has hosted a number of international conferences. Today, over 80% of local economy is in the service industry. Beppu like most of Japan has a hot and humid summer. While hot, rainfall is not as frequent during August. Beppu City does not have detailed weather data so nearby Oita City's weather data is used here. The Sonic limited express train departs from Fukuoaka City (Hakata Station). It takes 2 hours to reach Beppu Station. 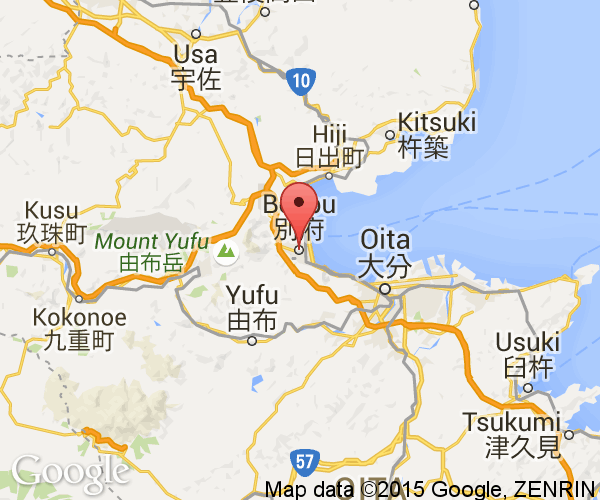 Other express trains depart from Kumamoto Station and Miyazaki Station that take 3 hours. By highway, it takes 2 hours from Fukuoka Interchange to Beppu City. Oita Airport to the northeast is the closest airport. 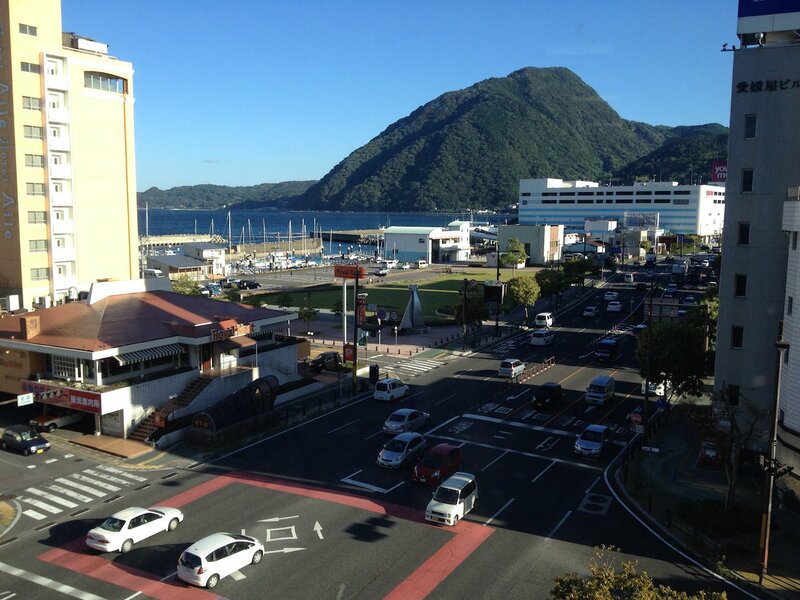 It takes an hour by express bus to reach Beppu. This regional airport has connections to Japan's international airports. The Ferry Sunflower connects the Beppu area with Osaka and Kobe. A ferry also cross to Shikoku and docks at Yawatahama City.